Back with another review for a Tony Moly product, thanks to BNTNews International! I am going to review a the Tony Moly Aqua Aura Moist Finish Pact SPF 25 PA++ from their Aqua Aura line. I'm not very familiar with the Aqua Aura line since I haven't tried anything from their line except for this one. I do know one thing for sure about it from my research, it should provide the user extra moisture to last throughout the day, perfect for people with combination to dry skin. 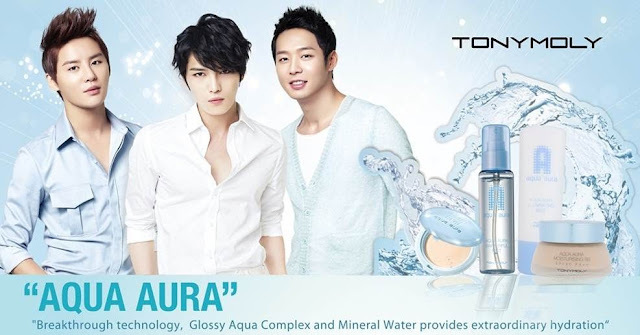 According to this banner I found thanks to Google image search, it is a "breakthrough technology, Glossy Aqua Complex and Mineral Water provides extraordinary hydration." The Tony Moly Aqua Aura Moist Finish Pact SPF 25 PA++ is a moisture tuning control powder that says to cover up blemishes tightly and evenly without drying up or clumping the skin even after several applications. It will make the skin look bright, transparent and radiant, as the product information states. Before going into the details of how this product worked for me, I believe that you, my readers, should have a background of my skin type first. I have normal to dry skin. Back when I was still a high school student, my skin was really oily, which is quite normal for someone who was undergoing puberty at that time, plus I was living in a tropical country (the Philippines) which was very humid. Anyway, my skin has changed a lot over the years especially around the age of 19. Sebum secretion has diminished evidently and since I moved to the US 2 years ago, my skin was practically in a normal state - not too oily and not too dry, though I occasionally experience some dry patches here and there around my chin and nose throughout the year and especially during winter. With that said, here's my honest review on this product. Since this product claims that it can cover up blemishes and even out skin tone without it being cakey on the face, one could definitely use this as some sort of powder foundation, especially great for people that doesn't need a lot of coverage. I tried using it by itself without anything underneath except for my daily facial moisturizer. Using the sponge it comes with, which is one of the nicest applicator I have come across, it applies smoothly and evenly on the face. It did even out my skin tone although the shade was a little light for me. I have received the #2 Skin Beige shade, and though it was a little light for me at first, I noticed that it did blend it with my natural skin color minutes after application, once it got to settle and oxidize. It does not look cakey at all though I didn't really pack a lot on my face to see if it would be cakey after so many applications. And even if it's basically still summer here, with my skin being normal to dry, I did see a bit of white, dry patches on my face after application. Leaving the dry patches alone and letting the product sit on my face for about 30 minutes or so, the dryness disappeared. I didn't feel the need to reapply throughout the day since my skin didn't particularly feel oily nor too dry although the coverage did wear off. The difference between using it alone and on top of a foundation is the coverage that you get. Depending on what type of foundation you use, coverage can be built up. Using this powder to set my foundation give me a really nice finish and I didn't find any dry patches on my face - thanks to using a liquid foundation which gives extra moisture. I also tried using this powder on top of a BB cream since BB creams are more moisturizing than regular foundations. Though the moisturizing effect is being doubled up, my skin didn't get too oily, it didn't dry up either. Layering with a foundation or a BB cream did give me a longer lasting coverage than using it alone. In conclusion, this product does indeed give you the extra moisture you need throughout that day. It is compact and it is great to carry around your purse for reapplication throughout the day if you need it. Having normal to dry skin, I do have to worry about dry patches upon application but as I said, I needed to give it time to sink in with my skin for awhile. Though I cannot say how wonderfully it works to control oil in oily to combination skin types but it is a product worth trying out. Nice review. I have never heard of this brand before thanks for sharing.